In a recent post, I discussed creating simple systems to help you work more effectively and reduce unnecessary cognitive load. It isn’t necessary to read that post to benefit from this post. But, I encourage you to save it to read some time. It is a bit long. In the previous post in this 3-part series, I discussed how to save time by removing bottlenecks when setting up meetings with students. First, some quick background. I’m a planner. I plan my classes (usually in the summer), meaning that I can look at my syllabus and know what we are going to cover on every day of the semester. This has its benefits but also some drawbacks. The benefits are related to 1) time management and 2) the ability to build the class to maximize the opportunity each day presents. It is of course easier to plan a class in the summer when you have less going on and focus on executing the class in the fall when there are many other demands on your time. Also, because I know what will happen each day, I can have semester-long projects with many parts that all inter-relate. And, the daily activities and lectures can be designed to cover the materials to support those projects. In terms of drawbacks, my approach allows for less flexibility when it comes to bringing in emerging topics, or adapting to student time needs, etc. So, I find it is important to build in a little flexibility if you take the approach I do. In the sense that every day of the semester has a plan, I need a quick and efficient way to know what we’re going to be covering on any given day in class. There are many ways one could approach this problem. Here is how I do it. I create a binder for each class. In the binder, I have a Word document for each day. The document is built using a template I created. I simply use a tab to mark what day of the semester we are on. And, before the class I open the binder to the page of the day of class we are on and review the day’s notes. When I create my plan for each day of class, I simply create a file using the Word document template for that day. I save each day as a separate file, ordering the files by lecture number. So, the first day of class is lecture 1 and so on. This all goes into a folder named for the class. Topic – the lecture day number so I know what it is when it is printed and in my binder. I’ll also have a few words on what topic we’ll be covering that day. Slides –I use Powerpoint slides for my lecture notes and for any in-class activities for which I will need instructions. For example, if we are doing a “simultaneous response” activity or any other educational activity or game, I put the instructions on the slides. So, if there is any lecture notes that day, I’ll have a slidedeck. Note: I name the Powerpoint for a day’s lecture the same file name as the Word document. So, Lecture 1.ppt, Lecture 2.ppt and so on (see example below). 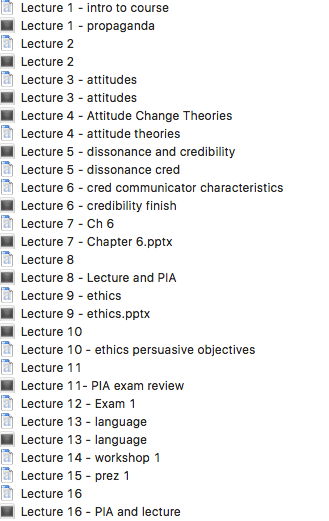 Thus, when looking at the folder on my computer, I see: Lecture 1.doc and Lecture 1.ppt one atop the other so that the Word and Powerpoint files are ordered sequentially in the folder. Supplies Needed: I provide the computer filename for any assignments, handouts or activities that I’ll be handing out in class that day. For example, if I am assigning a project and I know I need to print a copy of the assignment, I’d have the filename listed so I can easily find it in my “assignments” subfolder in the folder for that class on my computer. I’ll note any other needed supplies here as well such as if I need any props for class activities or any technology needs I need to bring. Activities: I note any in-class activities we have planned. For example, if we were doing a “simultaneous response” activity or an exam review, it is listed here. Assignments: There are 2 categories here. Assign and due. If I’m assigning something that day, I write “Assign” in front of it. If it is due that day, I write “Due” in front of it. Notes: Random reminders and notes to self about the class that day. For example, I’d add notes if I need to remind students about an upcoming deadline, or if there was a website I wanted to be sure to show, or things we need to be sure to cover in class that aren’t on my lecture slides. I even put notes to myself. For example, I may remind myself I need to write an exam that students will be taking in a few weeks. Under the notes section, I leave a blank space to put any announcements I need to post onto our course management system. By having these pre-written where possible, I can quickly post them to the course management page by loading the document on my computer and cutting and pasting the text into our CMS. Below is an example of my “Lecture 14 – promoting social media offline” day from my social media class (syllabus | all posts about the class). A few quick explanations: Students give presentations during part of the class. So I need to bring a way of taking notes on their presentations. I have a form that other students fill out to give feedback to the group presenting. And, I need to provide students with the group report card so they can evaluate one-another. The “Content Period #1” assignment is due that day. The notes are to myself, reminding me that there is a brief lecture that day after presentations and that I need to grade the presentations to prepare for an upcoming class. If you’d like to download a blank copy of the template I’ve discussed in this post, you can below. As I said in my post on using systems: “Using your memory when you don’t need to unnecessarily uses your energy and time.” Using this template helps me quickly prepare for a day of class. I spend about 5-10 minutes before going into class reviewing the Word document plan for that day and doing anything needed to prepare, such as printing anything or loaded any announcements. During this time, I also load up the day’s Powerpoint slides and quickly review the lecture to job my memory. In summary, as an educator you have too much going on every day during the semester to be scrambling around trying to figure out what you are going to be teaching in class. Good news. You can solve this repeated, predictable problem with a template system. If you liked this post, I would love it if you shared it to your network. In a previous post, I talked about the power of systems to simplify recurring tasks in our jobs as professors. In that post I mentioned that we can work to remove bottlenecks that unnecessarily slow down the completion of tasks. Here’s one such task that faces major bottlenecks: scheduling appointments. A certainty in our lives is the fact that students will need to make appointments with us. In addition to meeting with students about class projects, I’m also an academic advisor and advisor to student capstone projects. Needless to say, students are wanting to schedule meeting with me fairly regularly. In the old days, I didn’t have an effective system for scheduling appointments. It went something like this. I put my email address on my syllabus and told students to email me to schedule an appointment. So I’d get a long, detailed email that I’d have to comb through before a student got to the simple fact that they wanted to schedule a meeting with me. Or, I’d get some kind of cryptic email about an appointment. I’d respond by telling them my available office hours and that if they couldn’t come by then,to let me know some times they were available. For those who couldn’t make my office hours, we’d go back and forth until a common time was identified. During all of this, a lot of time was wasted. I had to look over my calendar and think about when I was available and when I wanted to hold a meeting. Then I had to suggest it to the student. And then read their response email and program the finalized time onto my calendar if a mutual time was found. And then I’d respond to confirm the meeting.. If no mutual time was found, we went back and forth like this until something was settled on. You know this frustrating dance. Think of how many unnecessary decisions are being made here, how much time is wasted for both you and the student? At the start of this school year, I decided to try something new. I found a free online meeting scheduling tool that integrates with my Google Calendar. The tool I use is YouCanBook.me but there are many other tools that are very similar. After connecting my Google Calendar, I programmed what days and times I am available into YouCanBook.me. For example, I don’t want to take student appointments before 10am or after 5pm. And I don’t take student appointments on Fridays since that is my research day. Note: My Google Calendar has all of my classes and appointments programmed onto it, so students can’t make appointments during those times. While the free version of YouCanBook.me gives you less control over your availabilities, I’ve managed just fine by scheduling a recurring event on my calendar for lunch time when I don’t want to be bothered. When someone makes an appointment, it syncs to my Google Calendar automatically and I get an email reminder (you can turn these off if you like). Thus, that block of time is no longer available on my calendar and it no longer shows up as available on YouCanBook.me. With YouCanBook.me, you get a unique URL that you share with people so they can schedule appointments. So, I put it on my syllabus and course management site. And I tell students at the beginning of the school year that if they want to make an appointment with me, this is the only way. I tell them that if they send me an email trying to book an appointment, I’ll reply with a template email telling with the URL telling them how to book an appointment with me. I probably spent an hour setting up this tool before the start of the semester during a peaceful Friday afternoon. I’ve had dozens of students schedule meeting with me this semester using this tool. I estimate I’ve saved a few hours of time that would have been spent going back and forth during a busy work day trying to schedule a meeting. And that is just in about 1/2 of a semester’s time. So I’ve already recouped the time I put in. And I can use this tool for years to come. In addition to class-related student appointments, we recently had our 2 week advising period where I had to meet with about 30 students over the course of two weeks to advise them on what classes to take next semester. I used YouCanBookMe for this as well and it was wonderful. And of course, you can use tools like YouCanBook.me to schedule any type of meeting. I’ve used it to schedule appointments with folks on campus who’ve wanted to schedule a phone or in person meeting. 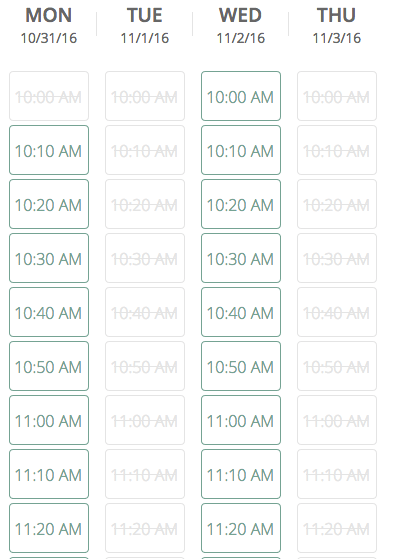 The number one thing I was concerned about when I switched to an appointment booking tool was losing control over my time. When someone emails you to schedule an appointment, you might be available at a time but simply don’t want to meet. So you don’t offer that time period for the meeting. 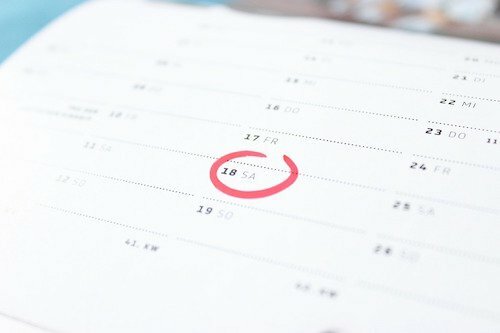 With a booking scheduling tool, the person can see all the times you are available that aren’t busy with events on your calendar. I thought I would find that really annoying. But, it’s a compromise I haven’t really been bothered by. Yes, there have been a few times that students have scheduled appointments when I wish they hadn’t. But, no big deal. If you want to mark off times on your calendar when you don’t have a meeting or aren’t teaching class yet you simply don’t want someone to book an appointment during that time, schedule something on Google Calendar at that time. For example, I schedule a lunch time on my Google Calendar. But you could also schedule private time for grading or for any other reason. Lastly, sometimes you need to plan a little ahead so someone doesn’t book an appointment at a time when you won’t be on campus. If I know I have a doctor’s appointment, I’ll mark enough time before and after on my calendar to account for the commute. In summary, an appointment booking tool is a great example of a simple system to deal with a recurring task: scheduling student appointments. It helps you save time and mental energy and puts you in control. I had an amazing time at the PRSA Educator’s Academy Super Saturday on October 22 presenting on tools educators can use to break down the classroom walls. After our presentation, Ai Zhang, Karen Freberg, and I were asked how we manage to engage with all of these different tools, keep our classes updated, and more. Honestly, it is a lot of work but also a lot of fun. Yet, in my answer, I mentioned two things that have helped me tremendously: 1) Simplicity in life and 2) systems. And I’d like to explain a little more about them. As professors, we’re constantly trying to balance opportunity and time cost. There may be several opportunities we’d love to engage in (such as trying a new tool like Slack in our classroom), that come with a deal of uncertainty. How much time is this going to take? What potential opportunity am I giving up if I take this opportunity? There just isn’t the time to do it all. At the same time, there are some aspects of our jobs that are certainties. Students needing to schedule appointments with us is one of those certainties. The fact that we are going to teach class tomorrow is a certainty – with assignments, readings, and more. Let’s talk about time and energy and how we can have just a little bit more of each in our lives by using two hacks: simplicity and systems. There are many productivity books, blogs, and gurus advocating the application of systems thinking to increase productivity. But one of my favorite advice books comes from Scott Adams, the creator of the famous Dilbert comic. The book is How to Fail at Almost Everything and Still Win Big. Adams advocates for the value of simplification in life and working to maximize personal energy. Systems are a great way to achieve both. Chances are, you’re already using systems in your life. But you may not be taking this systems thinking and evaluating how you can apply it more broadly. As professors, if we can create systems (both in our personal and professional lives) that help save time and streamline repeated tasks, we can get what we need to get done with an efficient investment of our most finite resource: Our personal energy. In the last year or so, I’ve been thinking a lot about this concept of systems. What systems am I putting in place in my life to manage repeated tasks and make my life simpler? I keep my personal life simple by using systems and rules to manage my time and personal energy. For example, when I was in graduate school the cost-effective grocery store was 8 miles from my house over the state border into Idaho. I was working 7 days a week at grad school life. So, I didn’t think it was time or cost effective to be running to the nearby, more expensive, grocery store every few days when I needed milk. And it certainly wasn’t effective to be scrambling to figure out what I was going to eat that night. I devised a simple system of grocery shopping every two weeks. I’d plan my meals for a two week period and then drive to Idaho on the weekend every two weeks to buy all of my groceries. By batching my grocery and meal planning and shopping time into 1 big event instead of many little events, I saved countless hours that would have been wasted debating what to have for dinner, driving to the store, wandering around trying to find things, etc. And I saved thousands of dollars by not eating out. Time and money are very valuable commodities when you’re in grad school. And this simple system was so effective that my wife and I still use it today. Ordering a pizza or hitting up the fast food drive through optimizes your time – it’s efficient. But it isn’t a system. The problem of needing to find dinner tomorrow will exist again tomorrow and you’re back to square one. Technologies can work as systems too. My wife and I have a wonderful dog, Scout. And, despite what you would think with all that hair, she doesn’t shed. But, her flocks are incredibly effective at collecting leaves, twigs, and other debris that get brought into our home and deposited on our floor. A few months ago, my wife and I invested in a Roomba vacuum. Between my wife and I, we were spending a lot of time sweeping up the floor in a losing battle. What a drain on our personal energy and time! Now, we have a simple system whereby the Roomba runs on certain days of the week. And, we spend about 1 minute in the morning on those days preparing the house for it to run – picking up things, moving a few things to block the Roomba from going into an unwanted area, etc. Then, after the Roomba is done I spend a few minutes cleaning it out. In the few months we’ve owned the Roomba, we’ve probably saved a good 10 hours of time that would have been spent sweeping. There was a repeated, predictable problem: debris from dog. This certainty in life could be better managed with a simple system. Designing some of the decision-making processes and stresses out of your life is also systems thinking. By choosing to live in a small town, I’ve systematically designed many of the daily frustrations many people face out of my life. Yes, there aren’t a lot of restaurant or entertainment options. My commute is simple and straightforward. But, just think about how many frustrations, stressors, and teeth-grinding decisions I’ve designed out of my life. Yet, living in a small town probably doesn’t appeal to many people. Or, maybe it does but you don’t have control over where you live. No matter. You can design your way out of the agony decision-making process in many aspects of life. For example, you’ve probably noticed that folks like Mark Zuckerberg and Steve Jobs always wore essentially the same thing. They designed the “what to wear?” problem out of their life. Frustration gatekeepers – I rely on what I call ‘frustration gatekeepers’ to filter information for me. Rather than staying up on all the latest trends in pop culture, I simply rely on other people who I know are good at doing that. And I take their advice. The same is true for shopping. By not shopping or going to restaurants much, I keep my head clear of stressors and unnecessary decisions. I have a brother who is more knowledgeable about fashion and clothes than me and enjoys shopping. And sometimes he buys things that he decides he doesn’t want but it’s too much of an effort for him to return. So I acquire the stuff directly from him (since we mostly can fit into the same clothes). He’s a perfect example of a frustration gatekeeper. He also knows a lot about cars and can quickly give me advice when I’m having problems with mine or when I’m car shopping. When something has been tested and found true by others across time, I can assume it is worth exploring. Then, by relying on these frustration gatekeepers, I can put my time and effort into the new tech and trends that I’m interested in, and stay up to date on social media, education tech, etc. These are simple examples and this topic could be it’s own blog post… or book. Yes Scarcity – Say no more often. Indeed, your default answer should be no. Saying no is a frustration gatekeeper. By saying no, you are closing the gate and keeping frustrations at bay. The problem is, it is hard to realize that we control the gate. We have the ability to say no or to say yes. As a professor, you are going to be asked to be on a lot of committees, participate in a lot of extra-curricular events, do public service, etc. If you don’t learn to say no, you’ll never have time to say yes to the things you really want to do. It took me several years of working in academia to learn this even though I’d been advised by others that I needed to learn to say no. I’d always been raised to say yes to opportunity. “You never know what door it might open,” was a common refrain. And that is very true. But, you also don’t know what door you might be closing in the future by saying yes to the present request. But as you establish yourself in your career, you can begin to be more choosy on what you say yes and no to. By saying no to things that don’t interest you, don’t benefit your career, or help those you are aiming to help, or further your mission (whatever that may be), etc., you are making yourself available for the opportunities that will. Time is finite. You can’t do it all. I finally realized that it is okay to say no and that is actually a good thing because it will leave me energized for the right tasks. And now, when I say yes to a project it is something I’m excited about and dive into and the rewards are greater and so too are the outcomes. Don’t make another person’s mission your own if indeed it is not a mission that you want to be your own. You are either working on your mission, their mission, or a common mission. Pick projects that are common missions. Otherwise, you’ll simply be unhappy, resentful, and won’t do great work. Of course, there are things you simply need to do, or that are polite and generous to do, or that are the right thing to do. That’s not what I’m talking about with the above. I’m talking about the extra projects you take on. When it comes to those, use your yeses wisely. Practice “yes scarcity” as a frustration gatekeeper. Sequencing – Is the simple process of prioritizing the things that need to be done before other tasks can be done. Seems simple. But a lot of people don’t do this. They simply pick a task and begin. Let’s say you’re making dinner. Why cut the veggies up first if the first task in the recipe is to cook the meat? You should cut the chicken up first, get it cooking, and then start chopping the veggies which will go in later. Instead, many people cut the veggies, cut the chicken, cut everything else, and then start cooking. And the task takes twice as long. Many things in life work this way, and an easy place to start is to re-analyze your routines. What is the first thing you do in the morning? In what order do you work out? Run your errands? But, we don’t often prioritize sequencing and thus we let time go to waste. Many things in life we simply need to start, and they take care of themselves with only a little attention from us – such as the pan heating up or water boiling, the chicken cooking in the pan, coffee dripping, the shower water heating up, the garage door opening, getting students working on one task while you hand back exam grades or take attendance, etc. When tackling a task, always be thinking about sequencing. What is the first thing that needs to get done to set up other steps that will maximize time efficiency? Which tasks are tasks that you simply need to set up, and they will take care of themselves with little supervision while you can work on something else? For example, when you walk into your office in the morning, the first thing you should do isn’t take off your jacket or put your apple in the drawer to eat later. It is turn on your computer since the computer takes a while to load. Then, take off your jacket, get yourself organized, and, if you’re me, spend a few minutes writing in a bullet journal and then get to work on your computer. But before I make this blog post way too long, let’s return to grocery shopping. Clearly this is a predictable, repeated task. So, I know I’m going to need to come up with meal ideas. Rather than eating the same old handful of meals and growing sick of them, my wife and I have created an evolving Google Doc of meals we really like. They are organized into categories such as ethnicity, what type of meat (or if they’re vegetarian) is in them, or whether they are warm or cold weather meals, or if they tend to produce leftovers and thus will cover two meals. It is simple. We take most of our meals from that list. And, we’ll try a new meal every two weeks or so. If we really like it, we add it to the list. So, we never eat something we don’t love. And we have dozens and dozens of meals to choose from. Using your memory when you don’t need to unnecessarily uses your energy and time. That’s why lists are great, simple systems that save you time when dealing with repeated tasks. Travel often? Create a packing list for the common things you need to pack with you. Create a list for what you need to do to prepare your home to be left empty, such as set thermostats, security lights, locks, etc. Free apps like Checklist and others let you create reusable task lists. For whatever reason, in the past, I’ve had a mixed record of applying systems into my professional life. When it comes to work, I’ve always been a ‘shoulder to the wheel’ sort of person. I didn’t necessarily work smarter. I worked harder. I put in the extra time to do things that should have been done in half the time. I’ve had a tendency to look at this as dedication – showing I care. But, as Tim Ferriss would say, rather than concerning yourself with showing dedication, focus on demonstrating results. I’ve taken stock of the systems I have been using at work. And, I’ve started looking for ways to question the way I currently do things and find simple systems. In the upcoming two blog posts, I’m going to explain two simple systems that I use as a professor to reduce uncertainty and/or save time and energy. One of those systems I’ve been using since I started teaching – my day-to-day class management system, and a second I began using this year – a system for scheduling student appointments. But before I do that, here are a few quick tips for applying systems thinking into your life. Is there a consistent (predictably recurring) problem that you are facing in your life or job? If so, it may be a contender for a system. Are there decisions you are making in life that you don’t need to be making? If so, find the system. I’d encourage you to start small. Create a system for dealing with a simple problem in your life. Dive in by creating a checklist or template for repeated tasks. Checklist systems – Write down the steps that you are currently doing to complete the task. If they are simple, repeated steps (like a packing list or things you always need to buy every time you go to a particular store) save your energy and create a checklist that you can repeatedly use. Template systems – There are plenty of instances where you can write a template letter or email that can be tailored to the situation in professional settings. For example, there are certain questions I tend to get from students. One such question is whether I’ll offer an override to a student who wants to get into a class of mine that’s full. I used to individually write an explanation as to why I can’t give them one. So I created an email template citing the policy. When I get such a request, I’ll quickly tailor it to the situation and send it to the student. Not only is time saved, but the students are getting a consistent, accurate answer. Gmail offers the “canned responses” feature for this. But, other email clients offer tools for using email templates. Next, think about batching tasks or automating your behavior. Batching – If the task is something you are repeatedly doing often (like my grocery shopping example above), is there a way to batch it to save time? Hint: Just as you don’t need to go grocery shopping every few days, you probably don’t need to check your mail everyday. Automating (aka, habits) – You’ve probably heard a lot about automation by way of software. But you can also automate your analog life. When you walk into your house, have a place to put your keys and wallet so you can always find them. This is automation (aka, harnessing the power of habit). You don’t have to think about it. You just do it. And you don’t have to waste mental energy looking for a lost wallet or trying to find your keys. Chances are, you are already doing this. Now, think about how you can create other simple automation techniques. Here’s a tip for doing so. Use a note-taking app on your phone like Google Keep. When you notice a frustration about how your life is organized (for example, you forgot to lock up the computer lab before leaving work for the day), jot it down. If it happens a few more times, set aside some time and find a way to re-organize (or, organize it for the first time). The goal is to not have to think about it. Use a habit-forming app like Habit Bull or others to help make your new procedure a habit. Or, create an evening checklist of things you need to do before leaving work. In a few weeks, every time you leave for the day you’ll leave on the side of the building where the lab is and walk by and check that it’s closed. That’s one more task that you’ve automated, saving valuable personal energy. Tools such as those described above can help you say no to chaos. If you’ve got the above things down, try moving on to bigger fish. If the problem is more complicated, identify what you are doing to complete the task that can be thrown out. What is the ‘middleman’ that is holding up the wheels of progress? How are you allowing the process to be more complicated than necessary? If you can take decisions out of the process or unnecessary exchanges between people, look for ways to remove these bottlenecks. I’ll talk about this concept more in the upcoming blog post on scheduling meetings with students. In all of these examples, it’s about designing your life in such a way that can help you focus on what is important to you. 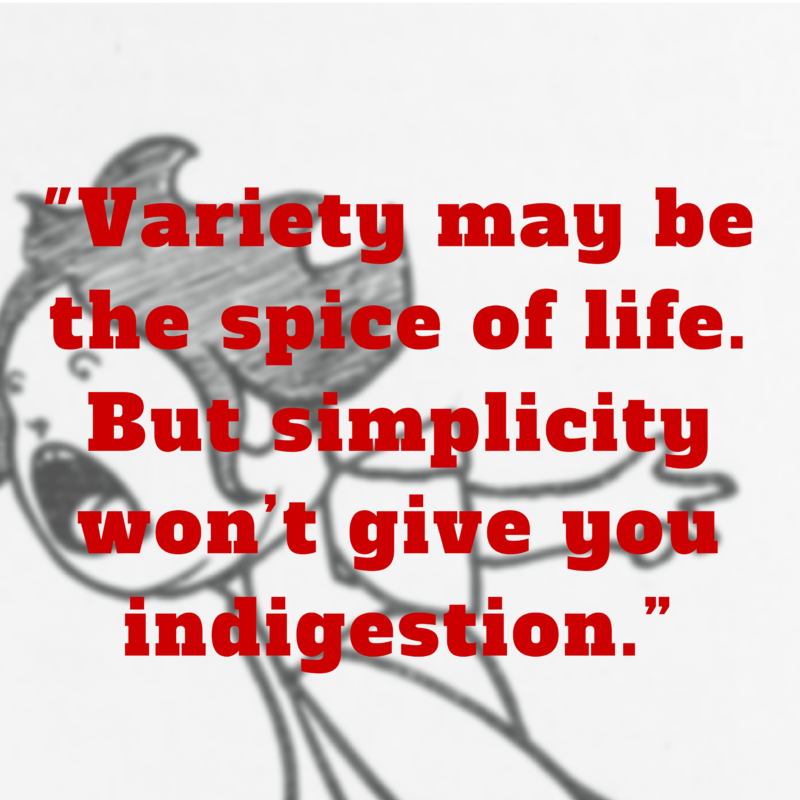 It’s not about complexity. It’s not about finding new, fun technologies and going searching for a problem to solve. Remember, the best systems are the systems that work. The simpler the system, the more likely you are to implement it. Don’t over-complicate it. p.s. I know this post was a bit outside the ordinary focus of this blog. I hope you enjoyed it. If you like posts like this, please Tweet me and let me know. I’m always looking for feedback. “Always Be Reading” is my motto. As professionals, we are constantly seeking to stay up to date with news, trends and developments. So I’m excited to write this quick off-week post between our regularly scheduled program to announce that you can now follow the articles I read and share on Pocket using their “recommendations” feature. I’m all about setting up systems to help me complete tasks and stay organized ( hope to talk more about systems-thinking in future posts). Long-time readers of this blog will know that I love to use the Pocket app to collect articles from the web to read later. For me, it has been super helpful in organizing all of the great content I come across on the web. That way, I’ve always got a list of great content I can read when I have time – not when it goes flying by on Twitter when I’m in the middle of something else. I even have my app use text-to-speech to read me articles while cooking or brushing my teeth. Most of what I share surrounds news and insights about education, social media, PR, marketing, advertising, journalism, political communication (not my personal beliefs, but news, analysis, developments of trends) and technology. But I’m also passionate about lifestyle design, productivity and academia. See you on Pocket. And I look forward to following you. Hope summer is off to a great start! If you’re like me, summer means writing, writing, writing! As I like to do once in a while, I thought I’d share another productivity tip for professors. Today’s tip has to do with Microsoft Word. 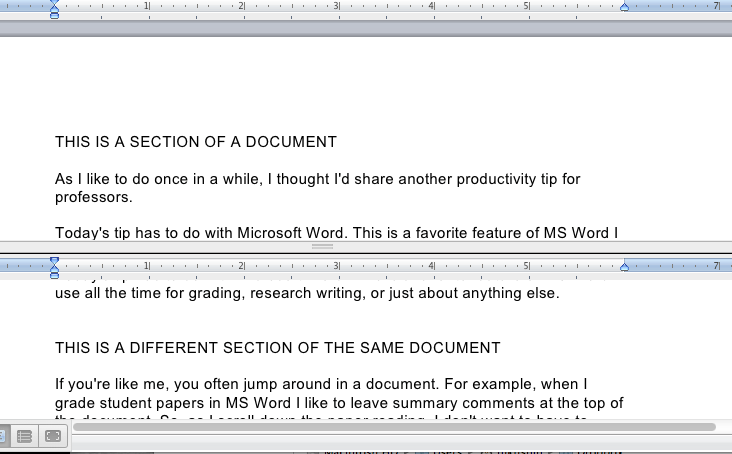 This is a favorite feature of MS Word I use all the time for grading, research writing, or just about anything else. If you’re like me, you often jump around in a document. For example, when I grade student papers in MS Word I like to leave summary comments at the top of the document. So, as I scroll down the paper reading, I don’t want to have to scroll all the way back up to the top, write a comment, then go back and find where I was in the paper. The solution? Splitting an open document so I can work on two separate parts of the same document at once. By splitting a document, I can have a section at the top open where I am writing comments to the student, and another section that I am reading. This is also very helpful when working on research. Commonly, I’ll have my document split so that I can work on a section while reading other parts of the paper. For example, when writing a discussion section it is helpful to have the lit review accessible to ensure I’m addressing topics/issues discussed in the lit review. Split splits your document horizontally so that the same window has a line that can be dragged up or down to create two sections in the window. In each section, is a different part of your document that you can scroll to. Thus, the document is split into two sections on top of one another. To use this, in Word click “Window” in the menu, and select “split”. While I love split, sometimes I want to work on the same document side by side, as opposed to stacked on top of each other. Using new window, you can have the same document in two different windows. You can work on the document in one window, and the changes occur instantaneously in the other window. New Window lets you do anything you can normally do with two separate windows – one on top of the other, side by side, one small one large, one minimized, etc., etc. To use this feature, in Word click “Window” in the menu, and select “new window”. In both cases, you are saving one file. So closing a split or closing 1 of the windows in new window doesn’t impact anything. Hope you enjoy this great saving trick! As I look back, 2015 has been a great year for me professionally. I’m always amazed at how much can change in a year and how much we grow in our profession in such a short period of time. As our careers progress in academia, it is as important as ever that we set goals and use winter break to push ourselves forward. I’ve always been one to set goals both for the short and long terms. 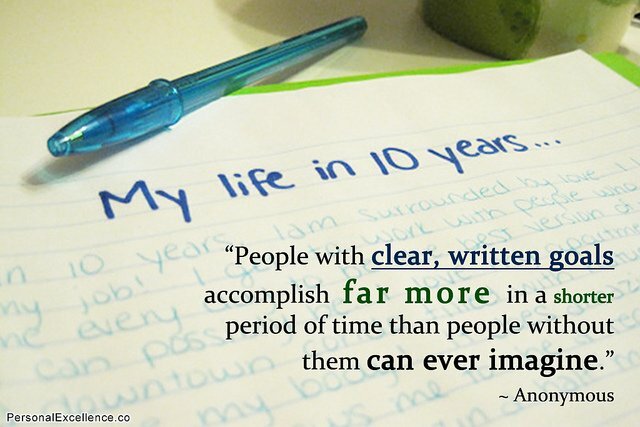 And I attribute a great deal of my productivity and success to goal-setting. Here are 3 types of goals I value. In the spirit of new year’s resolutions, I’d like to briefly share examples of each of these types of goals that I have. I hope that by sharing these, they get you thinking about your academic goals for 2016. Below are 2 process goals – the things it takes to achieve our goals, 2 outcome goals – things I want to accomplish, as well as one “think big” goal that is rolling around in my head. Staying Relevant As Social Media Matures – The field is constantly changing. It is both a blessing and a curse. I’ve worked hard this past year to make small adjustments to stay on top of things going on in the field as well as trying to take advantage of some of the amazing opportunities that have been presented to me. Often times, the small changes are easier to realize than the big ones. But, that doesn’t’ mean small changes are easy to do. Often time complacency is the curse of progress. We get comfortable where we are and before we know it, enough time has passed that we have fallen behind. As a professor, it is easy to look at the syllabus from last year and just stick with what we’ve been doing rather than updating. That is why I feel it is a priority to be constantly scanning the environment and staying proactive in making these small changes – such as to my syllabi and course content. Doing so, means avoiding major problems down the line. I spent the first week of winter break working on updates and changes for next semester. Of course, I’ll share some of them this upcoming semester on this blog. 🙂 One activity I’m really excited about is the BuzzFeed writing assignment we’ll be doing in my Writing Across Platforms class. Becoming More Effective With My Time – Productivity is something I think a lot about . As someone who is a bit of a workaholic, I’m never sitting still. I live on Wunderlist. I’m always thinking of things I’d like to or need to get done. There are so many exciting things to learn and do, and I like to think I’m interested in interesting things. 🙂 I feel I’m very good at completing tasks ahead of time, staying organized, and always doing what I say I will. But, with so many distractions today, I’ve found myself becoming less productive with my time. Time spent working doesn’t always equate to tasks completed. Too, I tend to focus very heavily on details and am a bit of a perfectionist – I think that’s the curse of being an academic. 🙂 So, the goal for 2016 is to use time more efficiently. 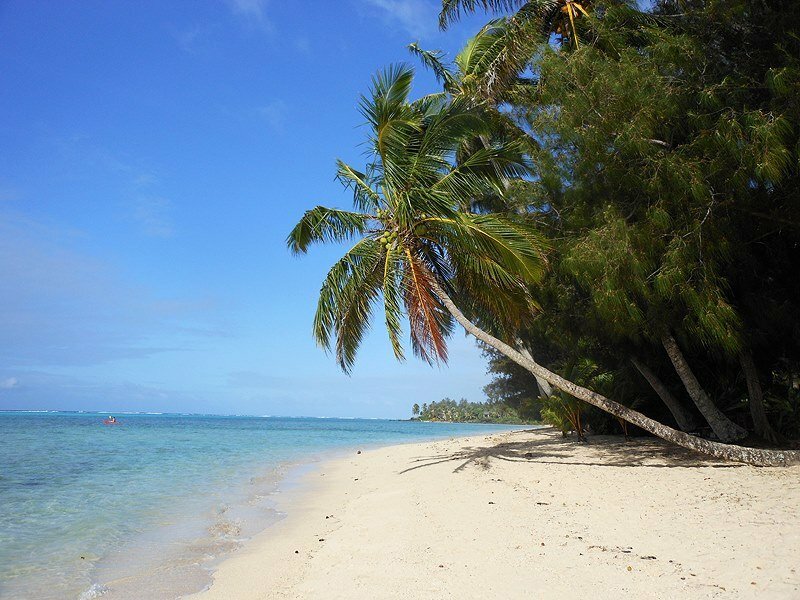 If I can do that, I can increase productivity, opening time for new opportunities as well as to enjoy personal time. I’m exploring a few different ways to do this. I read that one way to do this, is to track how you spend your time – the way you track your personal finances – to see where your resources are being spent. That way, you can get a baseline and see opportunities to optimize. So, I’m playing with using a time-tracking app such as Time Meter. I’ve also recently downloaded a fun little game called Forest that motivates you to not fall into the habit of ‘phone distraction.’ In recent months, I’ve gotten particularly bad at this. I think we can all benefit from taking back our time! Maximizing Educational Opportunities for My Students – Related to #2 above, I’ve been very fortunate that some new opportunities have presented themselves. Continuing to grow and build connections, in the end, creates opportunities for students. And that’s what I’m all about. This past year, I improved on bringing in some amazing outside professors and professionals as speakers in my classes. I’ve continued to grow and build relationships for internships and hands-on learning opportunities here in the Eastern Panhandle of West Virginia. As our Strategic Communication concentration finishes out its first cohort of students this spring, I’m aiming to continue to build in this area. Next fall, I’m hoping to possibly teach a new class, thus deepening the education I’m providing my students. Tenure – This one is out of my hands at the moment. 🙂 I’ve already put in my application for tenure this past October. Needless to say, a long term goal for the past 5 and 1/2 years has been to earn tenure. This spring is when I’ll find out! Finally, I spent a good deal of time this past semester thinking about that “next step” for the strategic communication concentration as it grows past the graduation of our first cohort this upcoming spring. A Social Media Listening/Command Center – Picture a place where students can go to monitor social media, track trends, perform analytics and more. Think of your favorite brands. In all likelihood, they have such a command center. I would love to build a small social media listening or command center for the students here in our department. We currently use Hootsuite Universitiy for our Social Media class, which is an amazing tool for monitoring and scheduling social media. But, it is not a metrics platform. I’d love to add to that an analytics tool for looking at trends. Several larger programs have such command centers, such as Clemson and Illinois State’s SMACC (by the way, Nathan Carpenter who runs SMACC is amazing. He was so generous with his time telling me about their impressive initiative have developed programs like this. His energy, knowledge, and initiative are extremely motivating). We’re a small program and the biggest hurdle is access to metrics software. And so it is going to take some creative problem-solving to make this listening center a reality for my students (I’m very open to your suggestions, ideas, or interest in this project – Tweet me). I wrote about the need to up our offerings for teaching metrics back in February and expressed some ideas and frustrations on the issue. I believe integrating a command center with classes and extra-curricular opportunities is a worthy, long-term goal that will have an enormous impact on our students and our community. The year ahead is filled with promise. And these are some of things I would love to accomplish. I hope this post helped you think about your process, outcome, and dream goals for 2016! Let me know what your goals are in the comments. If you have suggestions on how I can optimize my goals, please let me know. I hope your 2015 was amazing, productive, and rewarding. Best of luck in 2016! I like to write posts every once in a while about productivity tips and tricks or time savers. That’s because I know I love reading these types of posts and believe maybe some of the tricks I’ve picked up along the way might help others. I wrote the below blog post months ago but never got around to publishing it. When I came across the Umano app yesterday I was so happy. I was also reminded about the below post I’d drafted. I’d been long using Pocket and my Mac computer to achieve what Umano does. But Umano uses real voices rather than the robot in your computer or phone. This is a huge time saver. I get lots more content when I’m doing things that prevent me from reading – like brushing my teeth or cooking. You want to read more but don’t always have time to. You know that staying up to date on the latest news and trends in your field is no longer an option. It’s a must. 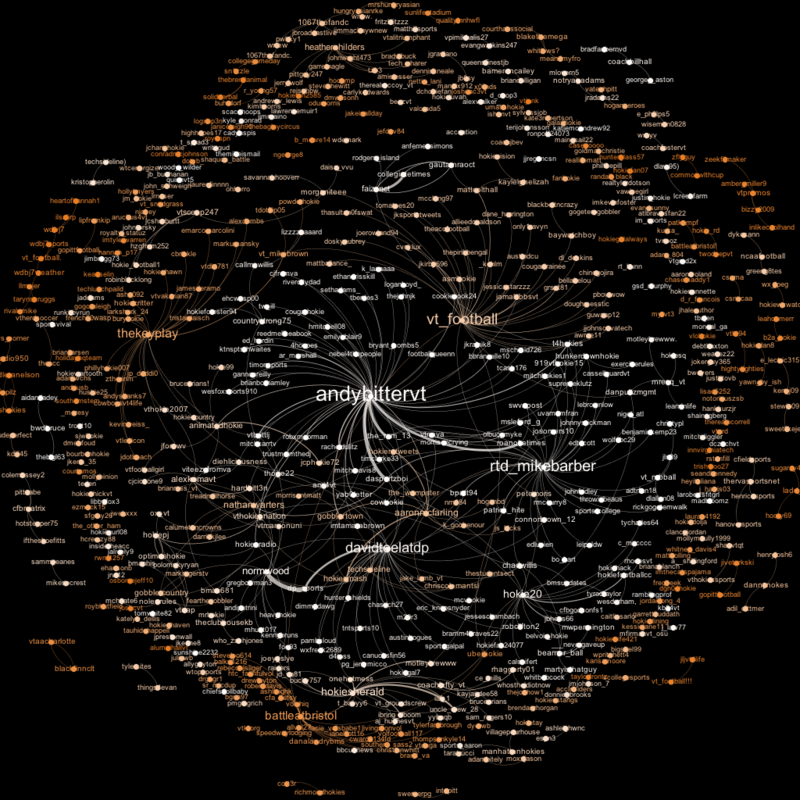 But great articles go whizzing by on Twitter or your RSS reader that you never get around to reading. You’re busy. That’s why having your computer or smartphone read to you is an efficient way to save time while staying up to date on the latest buzz. Imagine having blog posts and news articles are read to you while getting ready for work in the morning, cooking dinner in the evening, working out at the gym, or.. well, anytime you don’t feel like staring at a screen. A student told me about this about two years ago. He’d have his Mac read him the online assigned for my class while he cooked dinner. (I’ll explain how below). But since you can’t always be at your computer, there are smartphone apps that can read to you on the go. The one I’ve used is called Pocket (formerly ReaditLater) for Android. 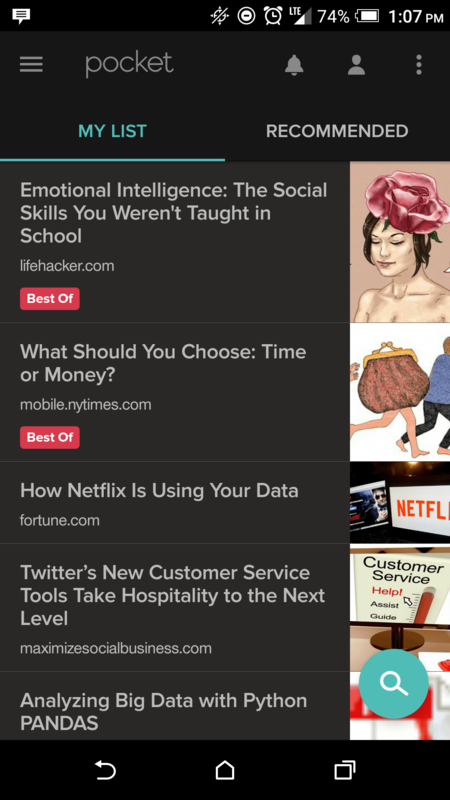 Pocket is a simple but extremely useful app that allows you to collect articles on websites, blogs, news outlets, and so forth. There’s a browser plugin for that. Installing the plugin adds a button on your browser. Click it whenever you’ve got an article open in your browser that you want to save for later. All the articles you “pocket” are saved to your account and accessible on your app, on the web, or on your Mac via their app in the Mac App store. In the Pocket app on your Android, select the more button (in the top right. It looks like 3 buttons on top of each other). And then Listen. To get your Mac to read text to you, go to Settings -> Speech. Click “Speak selected text when the key is pressed.” Then select the key command you want to use. I use COMMAND+S. Now, go into MS Word or a website in your browser, highlight the text you want the computer to read and click your command key. Your computer will begin reading. As I said, I’ve been doing this for about a year. The voice sounds like a robot. But it’s not hard to comprehend and I don’t mind it. The way I see it. Time is precious. Time management is learning to maximize time – and time spent doing mindless tasks like cleaning, getting dressed in the morning, etc. are perfect opportunities to get more out of time. How do you “get more out of your day”? If you’ve tried having your computer or phone read articles to you, how have you found it? logos: copyright of their respective companies.